Their is a positive relationship between digital signage and health care institutions (and more precisely, their profits). The success- stories related by health care professionals themselves make a strong point in this direction. The supporting arguments for this statement are to be found below but the list should not be seen as exhaustive and can be enriched by an institution’s features and goals. 6. Promote the services/ products of partner institutions and incur advertising revenue (by selling screen space). Leverage your partnerships and turn them into an additional source of revenue for yourself and publicity for your partners. Digital signage (or strategically located screens displaying ads and general info) enable you to achieve all that cost- effectively and without the burden of an IT department. The Saas (software as a service) implies that you don’ t need highly skilled IT staff and you don’t need to worry about storage, server bandwidth or backing up your data. Consequently, the user-friendliness of the system allows you to focus on what is of utmost importance to you: your patients. If you would like to know more download our white paper or contact us for a FREE consultation. 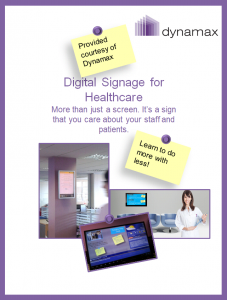 This entry was posted in Digital Signage, Heathcare, Tips and advice and tagged #avtweeps, #digitalsignage, #proav, advertising, digital signage for healthcare by Dynamax. Bookmark the permalink.